Springtime is here! All the beautiful colors and flavor in this Pasta Salad with Artichoke Hearts & Feta pair perfect as a side to any springtime meal. All the vibrant veggies make this Pasta Salad with Artichoke Hearts & Feta the shining spring star on the table. 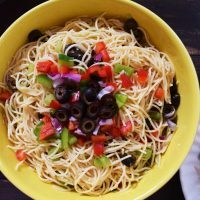 The blend of bowtie pasta with the color of tomatoes, black olives, onion (I left this out because my family doesn’t like raw onion – sigh me) and bell pepper along with the tender artichoke hearts make for a beautiful dish! The addition of pepperoni lend spice to the dish, while the feta adds some bite and creaminess that put it over the top. Spring gives us an abundance of flavors from herbs to so many delicious veggies, this makes any meal just burst with happiness! With all that happiness going on we find ourselves dining outdoors and spending time with family and friends as the days linger a little longer. The birds are just singing now calling me outdoors! And with that, I don’t know about you, but we start firing up our grill on so many occasions in the spring. I can smell the aroma in the air as the fresh breeze welcomes in this beautiful season. This Pasta Salad with Artichokes & Feta is perfect addition to your grilling or any picnic. 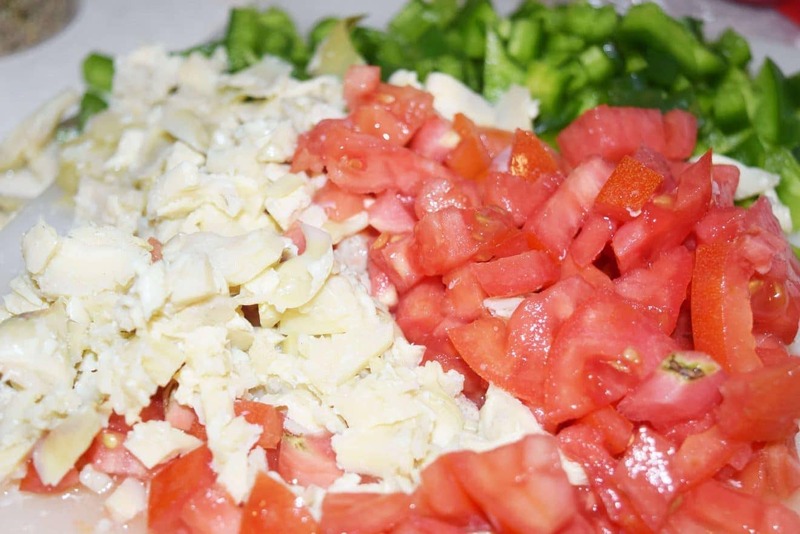 Whisk together your dressing. It’s olive oil, white wine vinegar, garlic, parsley, basil, oregano, salt, and pepper. Once your pasta is done rinse with cold water and drain. Then add all your chopped veggies, olives, and pepperoni (sometimes I chop up thin pepperoni or I will add the little round ones you can purchase – Aren’t they just so cute?) Toss it all together. 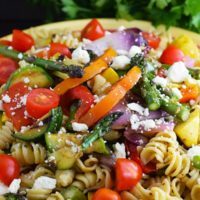 Then top with your feta cheese and refrigerate for at least two hours, so all those flavors can come together and make this a heavenly pasta salad! After all that deliciousness sits a while in the fridge, toss in the feta and you are ready to plate or serve buffet style, whichever you prefer! Head over and visit two of my favorite links ups Weekend Potluck and Meal Plan Monday for some fabulous recipes!! Cook pasta as per package instructions. Rinse in cold water and drain. 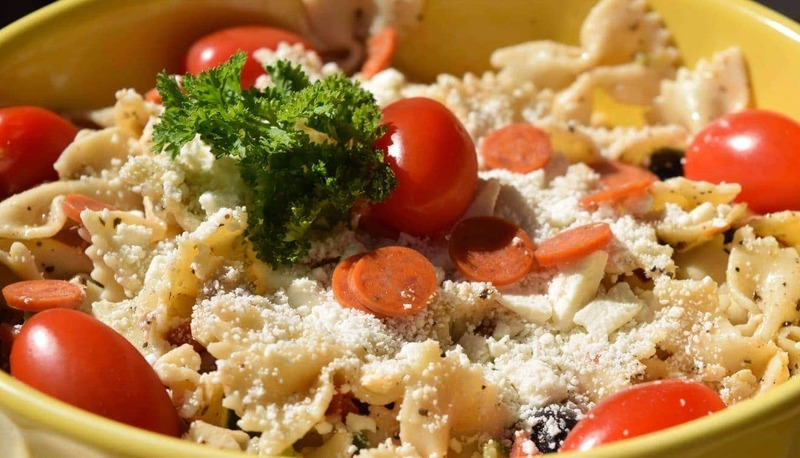 Combine pasta, tomato, artichoke hearts, green pepper, onion, pepperoni, and olives in a bowl. Make dressing. Whisk together olive oil, vinegar, garlic, parsley, basil, oregano, salt, and pepper. 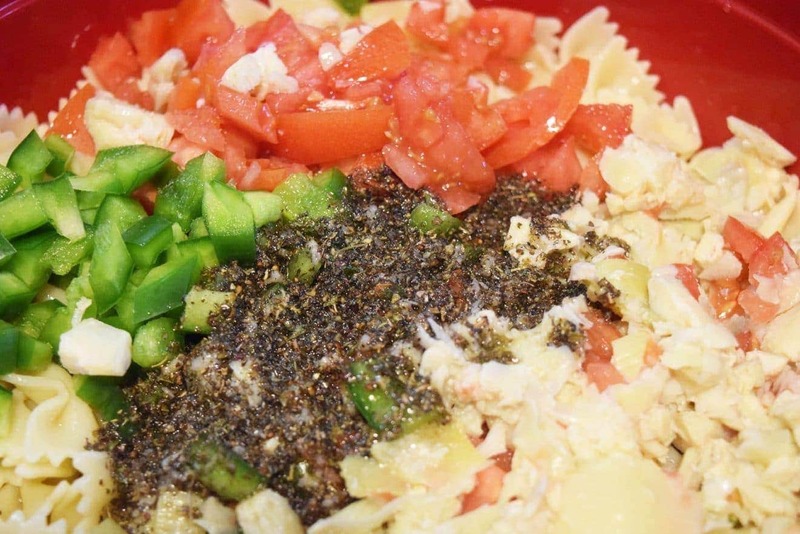 Pour dressing over pasta salad and mix well. 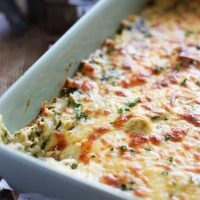 Top with feta cheese and refrigerate for 2 hours or overnight. Start your spring off with these delicious recipes from the Sunday Supper Tastemakers! I didn’t see pepperoni in the recipe list but it should be part of this great salad! Thank you! I think it would be a perfect way to welcome in spring! Enjoy! Nikki, I also noticed you mentioned to add pepperoni but left it off the list of ingredients. Ok, so, how much pepperoni? Also, I notice in the picture of the salad sliced carrots lay at the bottom of the salad. This adds beautiful color; are the carrots cooked and cooled. I think I will cook and marinate them in the juice from the jars of artichoke hearts. Sounds good to me. Welcome, Marianne! Thank you for catching that! I have corrected. At the bottom of the plate are actually mini pepperoni! Sometimes I use diced/sliced ones and other times I grab the bag of those cute mini ones! Happy, happy first day of spring! This pasta salad sounds incredible. Artichoke hearts are my all-time favorite food and I love feta soooooo much. I need this salad in my life! Happy Spring Kelsie! Thank you so much! I think you would love it too! I have been making it for years! I won’t say how many lol! But it’s a keeper for sure! Enjoy! I just love adding artichoke hearts to my salads….and olives, and tomatoes….. This looks wonderful!!! Thank you Liz! I love all them too! 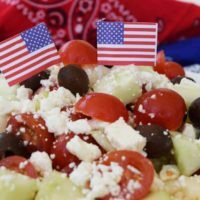 Antipasto and Greek pasta salads are some of my favorites for summer picnics and BBQs. I especially love that yours has artichoke hearts in it. Me too! Thanks I love the artichokes in this gives it a little something special! Yes, feta is a terrific addition to pasta. Love it. I love feta in almost anything, but especially in pasta salad! Thank You! I love feta in anything, but especially in pasta salad! Thank you! What a great side for some grilled meat! It looks delicious! It is a great side for grilling! Thank you and enjoy! yum! I love feta and pasta together. Looks very tasty! Thank you David! Hope you give it a try!